Narcissistic Or Not, 'Selfie' Is Nunberg's Word Of The Year Linguist Geoff Nunberg says he feels a little defensive about choosing "selfie" — a word that wears its ephemerality on its outstretched sleeve — as the word of 2013. But not only was this a year when we couldn't stop posting photos of ourselves online; we couldn't stop talking about it either. 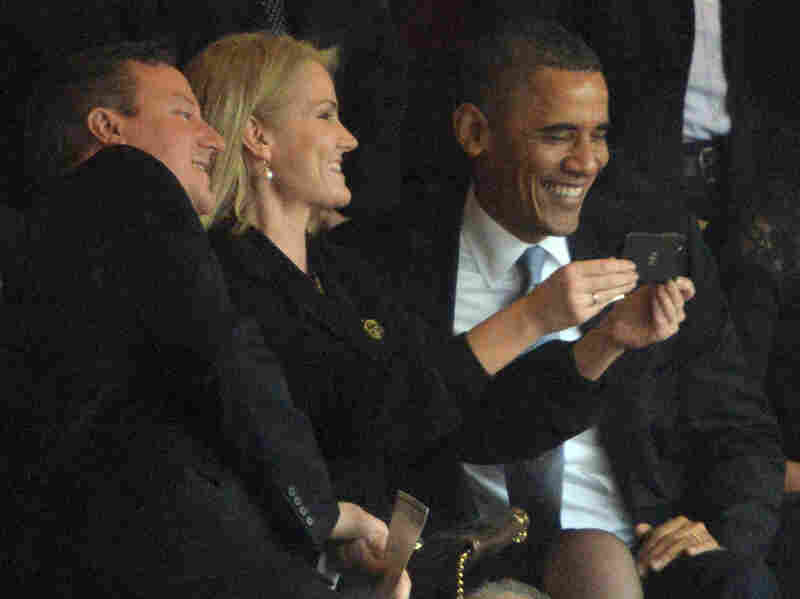 President Obama and British Prime Minister David Cameron pose for a "selfie" with Danish Prime Minister Helle Thorning Schmidt during the memorial service for Nelson Mandela. I feel a little defensive about choosing "selfie" as my Word of the Year for 2013. I've usually been partial to words that encapsulate one of the year's major stories, such as "occupy" or "big data." Or "privacy," which is the word Dictionary.com chose this year. But others go with what I think of as mayfly words — the ones that bubble briefly to the surface in the wake of some fad or fashion. Over recent years, the people at Oxford Dictionaries have chosen items such as "locavore," "hypermiling," "refudiate" and "unfriend," among others. You'd never know it was a period touched by economic collapse, bitter partisanship, or the growth of the surveillance state. So I wasn't surprised when Oxford announced last month that their choice for the word of the year was "selfie," which beat out "twerk" and "binge-watch." It struck me as a word that wears its ephemerality on its outstretched sleeve — any phenomenon whose most prominent evangelists are Kim, Kourtney, Khloe, Kendall and Kylie, not to mention Justin Bieber, probably isn't a good bet to be around for the long haul. What changed my mind about the word was the uproar over the photo that the Danish prime minister took with President Obama and David Cameron at the memorial ceremony for Nelson Mandela — and not because it was a selfie, but because it really wasn't. There are people who use "selfie" for any picture you take of yourself as a document or record, even a passport photo. But that isn't why the word was invented. It's natural to want a photo when you find yourself sitting between the president and the British prime minister, or if that doesn't work for you, imagine standing next to the pope or Mariano Rivera. And now that the camera lens has migrated to the front of the smartphone, you don't have to look for somebody else to take it for you. But "Selfie" came into existence for the pictures people take of themselves to display on social media sites like Instagram and Tumblr, often in stylized poses or artfully faded effects. 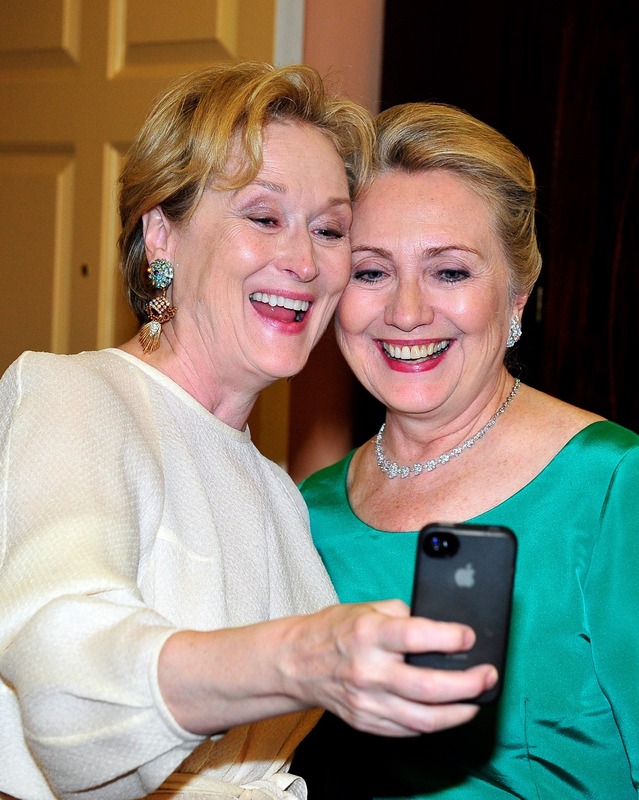 Actress Meryl Streep takes a photo of herself with then-Secretary of State Hillary Clinton in Washington last December. For a recent fad, selfies have unleashed a torrent of portentous yammer and invective. The word imputes an aura of narcissism to whatever it's attached to, whether it's apt or not. Use "selfie" to describe that banal Johannesburg snapshot, and all of a sudden Obama becomes the "selfie president." A columnist at the New York Post writes that the event "symbolizes the global calamity of Western decline." That gives "selfie" a cultural resonance you're not going to find with any of the other word-of-the-year finalists, not even "twerk." The word lends itself to that coloring. The "self" of "selfie" may originally have come from "self-portrait," but once it's detached, it oscillates between positive and negative meanings depending on what follows it — from "self-esteem" to "self-regard," from "self-awareness" to "self-absorption." And the diminutive suffix on "selfie" can seesaw in the same way, from endearment to insult. "Selfie" began its life as cutesie slang, like "prezzies" for presents, but now it's often derisive. The name sounds infantile, like "hankie" or "tummy." That's how most people think of selfies. Men and women may take plenty of them, but say "selfie" and you evoke the Kardashians or a 16-year-old girl, not Meryl Streep with Hillary Clinton, or Geraldo Rivera posting a Twitter picture of himself naked to the waist. And that's where a lot of the debates are focused. Are the selfies girls post a desperate kind of approval-seeking or the male gaze gone viral? Or are they tiny bursts of pride, empowering women to challenge conventional standards of beauty? Are they pure exhibitionism, or a kind of visual diary? The answers, boringly, are yes, yes, yes and yes. Adolescents do selfies in different ways and for different reasons, just as grown-ups do with the other images that they feel the need to bring to the attention of their friends and followers — of their dinner cocktails or the view from their hotel window in Oaxaca. There are people who have written about this with subtlety — I think of The New York Times' Jenna Wortham. But most readers aren't interested in stories about selfies that begin with fine distinctions. In a competitive media environment, the phenomenon calls out for a Grand Unifying Theory, for taking a stand for or against. Or better still you can make the selfie a proxy for all the deleterious effects of social media — oversharing, incessant distraction, fragmented identity, low self-esteem, and anything else that ails the culture. Hence the spectacle of critics and columnists vying for eyeballs with scathing denunciations of a "selfie society" where people will stoop to anything to get attention. The connection to young girls isn't lost in all this — phrases like "the selfie society" are meant to evoke a flighty puerile narcissism. It may seem a stretch to pin down the state of the culture by pathologizing what adolescents are doing on Instagram. But we have a penchant for diagnosing narcissism where other ages would have seen nothing more than old-fashioned vanity. Anyway, I give the critics a lot of the credit for making "selfie" a contender for word of the year. When we look back on 2013, we'll recall this not just as the year when everybody was posting pictures of themselves on social media, but as the year when nobody could stop talking about it.